The Cowboy Birder: Late, late Tree Pipit! 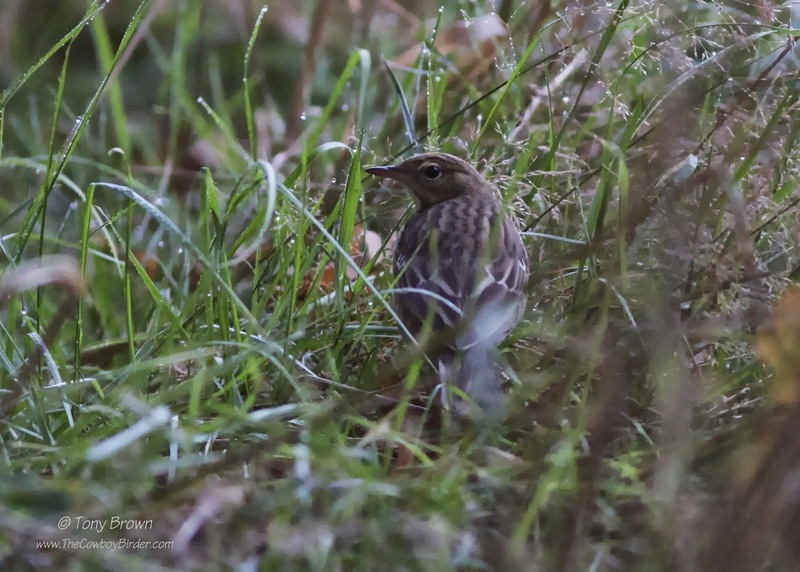 This bird got my heart rate up on a wet and miserable morning on Wanstead Flats! 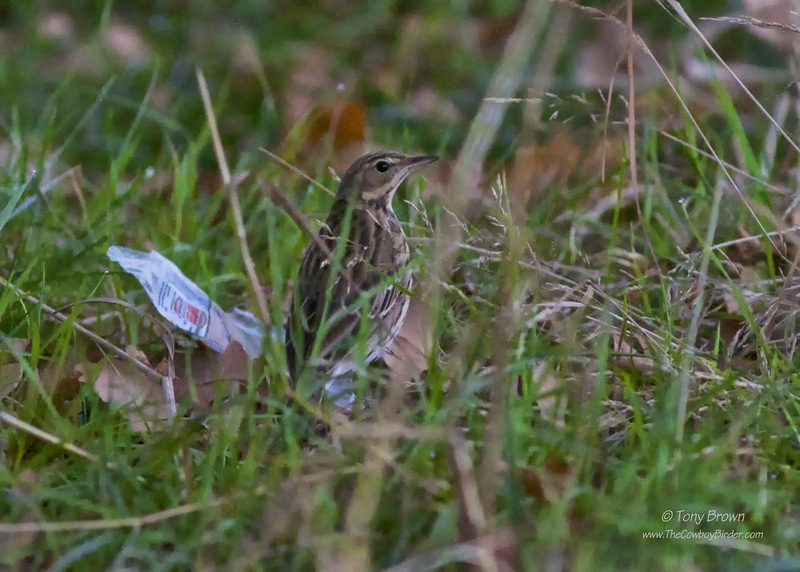 As I circled the SSSI area, cutting through motorcycle copse a Pipit silently flew up from the grass into a small Hawthorn bush - straight away I instinctively knew this was no Meadow Pipit. Employing my best field-craft skills (i.e not crashing in after the bird) I waited to see what it would do next, and although the bird wasn't visible on the bush, in time it did reappear, dropping to the ground - where it calmly walked and worked its way through the wet grass. I followed its movements for the next ten minutes, before finally losing sight of the bird as it flew up into one of the Oak trees as the rain started to fall even heavier - at no time did the bird call. 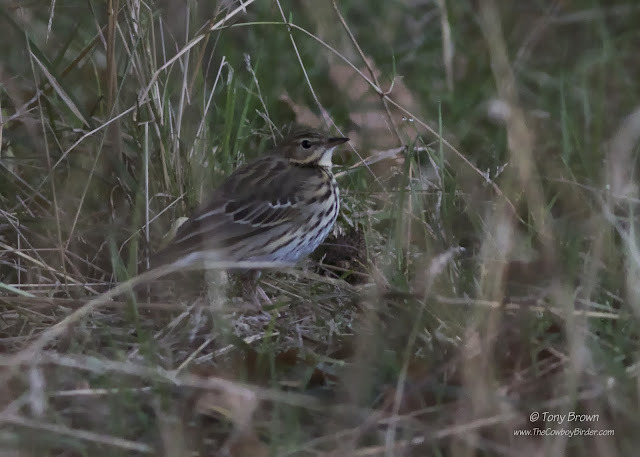 Getting better views of the bird I could clearly see my instincts were right and by all accounts I was watching a Tree Pipit - a very late Tree Pipit at that! 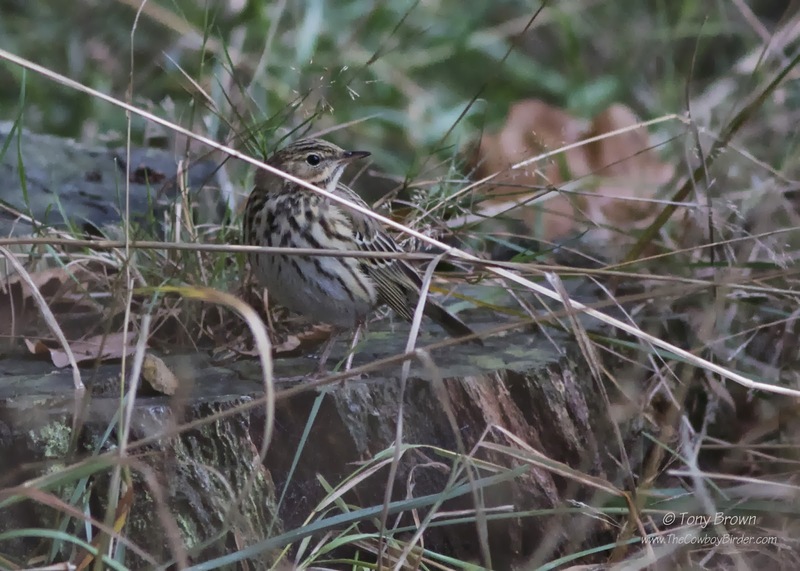 This autumn the last record of Tree Pipit on Wanstead Flats was September 21st, with another one at Rainham Marsh on the 29th, and there is only one record in October this year in the LNHS recording area, with a bird at Wormword Scrubs on the 13th. 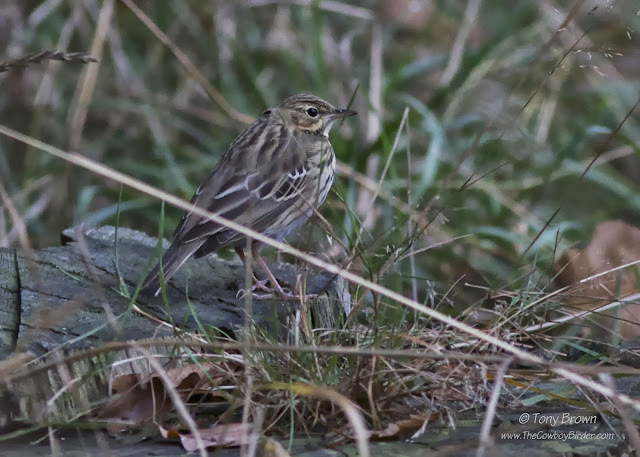 As you can clearly see all the obvious features you would expect to see on Tree Pipit are there when compared to Meadow Pipit; Harder faced, with a strong looking bill, broad submoustachial stripe, bold streaks on the breast - finer on the flanks, and even the shortened hind claw is visible on the third image. Sadly with a heavily streaked mantle, lacking in any olive tones - my hopes of this being an Olive-backed Pipit were clearly dashed! Will do Matt - thanks for reading and commenting.